I read The Paris Wife by Paula McLain several years ago, and I really enjoyed it. I knew very little about Hadley Richardson or Ernest Hemingway before picking it up, and I thought it was a fascinating introduction to these real people from the past. While it was a fictionalized account of their marriage, it brought history to life for me. I took certain aspects with a grain of salt, but I still couldn't put it down. When I found out that McLain was writing another book in a similar vein, I couldn't wait to see who she'd highlight next! 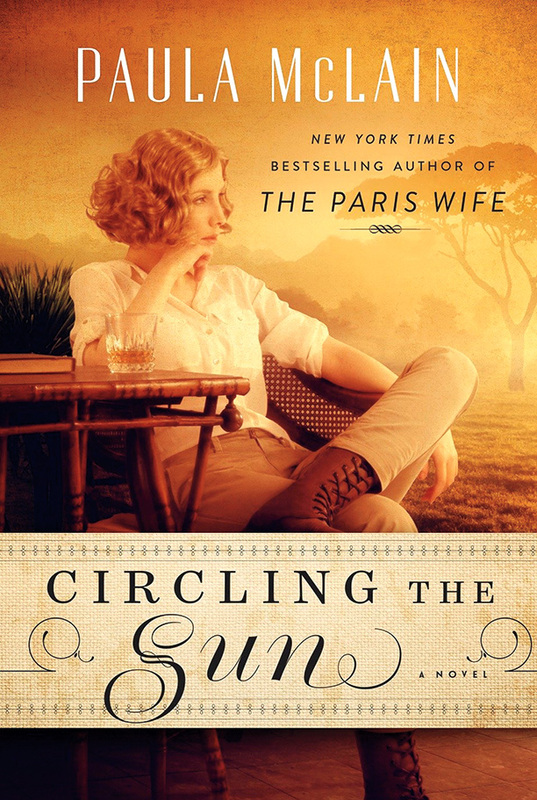 I'd heard the name Beryl Markham before I picked up Circling the Sun, but I didn't know much about her. Honestly, I'm not sure I would have been able to tell you that she was the first woman to fly across the Atlantic from east to west. And I certainly wouldn't have known that she moved to Kenya from England as a child, was abandoned by her mother, had an unconventional and somewhat wild upbringing, and spent the rest of her life pursuing her passions. So, I loved that Circling the Sun immersed me in Beryl's story! Before I tell you what I enjoyed about this book, I feel like I should preface it with a little disclaimer. If you want to know about Beryl Markham's professional achievements, I'd recommend picking up her memoir, West with the Night, instead. Published in 1942, Beryl wrote about her experience growing up in Kenya and how that led to her career as a bush pilot there. I haven't read it yet, but I'm certainly planning to now! I think the biggest weakness of Circling the Sun is that it focuses more on Beryl's personal problems and romantic entanglements than on her incredible accomplishments. It doesn't shy away from those parts of her story, but it does spend more time on her complicated relationships with her family, her peers and her significant others. No matter how much I enjoyed the book, I couldn't escape the fact that it diminished Beryl in some ways. I don't know if the focus on her romances was meant to humanize her, to make her more relatable, but it did the opposite for me. It shifted from what she did with her life to how she felt about things. There are moments where her story is reduced to her relationships. That bothered me - and not just because I struggled with some of her choices. Disagreeing with some of her decisions doesn't change the fact that I admire many of the ways she defied convention and forged her own path. And I would have loved if that had been McLain's focus! Before reading Circling the Sun, I had no idea that Beryl was the first licensed female racehorse trainer in Kenya and was a renowned figured in the racing community. I'm a huge horse lover, so this was probably my favorite aspect of the book! I wanted more of this - and more of the aviation story - and less of the drama in her love life. Now, I'm dying to read Beryl's memoir because I want her to speak for herself. I'd like my most lasting impression to be reading her story in her own words. I have a feeling it will make me like her more. I had a complicated reaction to the way parts of this story were told, but I still really enjoyed reading it. I just like the way McLain writes. The story starts a bit slow, but I was completely engaged before too long. It's not a fast-paced read, but there was enough happening to hold my attention. And I love books set in Africa, so the setting was definitely one of my favorite things about this book. I could picture the place in my mind! I've never read about anyone quite like Beryl before, and I thought she was such an interesting person. I didn't always agree with her, but I don't have to like a character to enjoy reading about them. That's what happened with Circling the Sun (and, honestly, with The Paris Wife). If you're a fan of McLain or historical fiction about real people, I definitely suggest picking up Circling the Sun. It wasn't perfect, but I learned something new and was left wanting to know even more about the woman at the heart of this story. "We're all of us afraid of many things, but if you make yourself smaller or let your fear confine you, then you really aren't your own person at all – are you?" Circling the Sun sounds utterly fascinating! I had no idea who Beryl was prior to reading about this book and your review, but you make her sound like such an interesting figure in history to read about. I think she sounds like quite the adventurer!